Home / Guides / How Are Alcohol-Fueled Emotions Explained? How Are Alcohol-Fueled Emotions Explained? As of 2015, an estimated 15 million Americans – including roughly 623,000 adolescents between ages 12 and 17 – have Alcohol Use Disorder (AUD), a condition characterized by compulsive alcohol use and an ongoing negative emotional state. 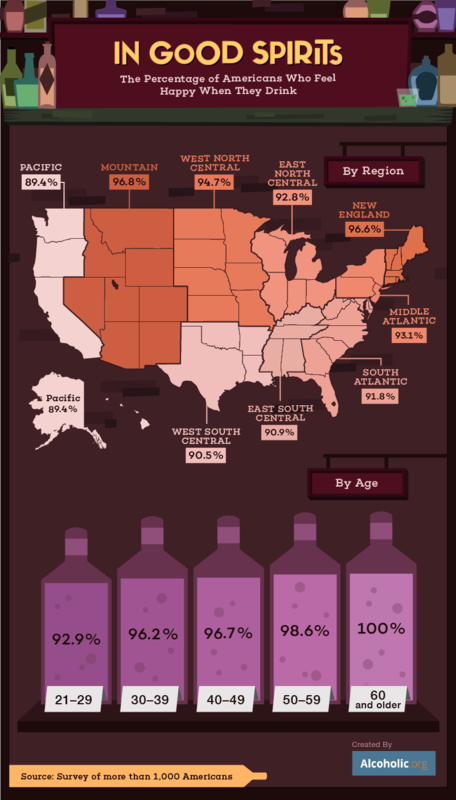 For many, alcohol is described as a fun, social substance. Drinking alcohol can make people feel happy in the moment, but it can also leave them grappling with negative emotions long after the bottle is empty. We surveyed over 1,000 people across the U.S. to understand how drinking alcohol makes them feel, from nostalgic or creative to sad or anxious. 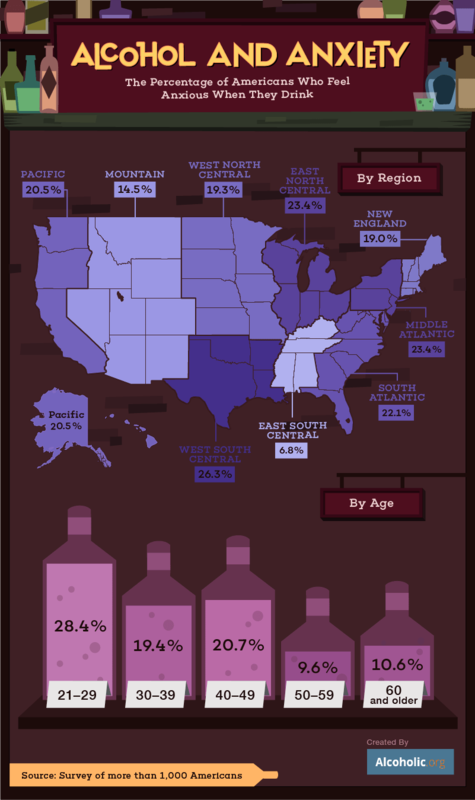 Read on to see what we uncovered about the emotional effects mixing with alcohol for men and women across the country. There’s no question that excessive drinking can have a negative impact on the body and the brain. The cerebellum is one of the most sensitive areas of the brain to the effects of alcohol because it has the ability to control functions like memory and emotions. Alcohol forces our bodies to create an increased amount of serotonin and endorphins, which are responsible for regulating our emotions and our sense of relaxation and happiness. Ultimately, the more often you drink, the more vulnerable your brain becomes to the effects of alcohol, potentially making your moods more volatile over time. While nearly 95 percent (or more) of the men and women we polled told us that drinking made them feel happy (not uncommon as a result of the extra endorphins), many told us they felt other less enjoyable emotions as well.Nearly half of men and more than a third of women said they felt disgusted while drinking, and more than 1 in 5 said drinking made them feel anxious. More than 1 in 10 men revealed drinking made them feel scared. Alcohol is a tricky substance. It may cause our body to release endorphins (making us feel relaxed and euphoric), but it’s also classified as a depressant. If you’re predisposed to mental health disorders, alcohol can exacerbate the effects of certain conditions – including anxiety and depression. In some cases, excessive alcohol consumption can even lead to suicidal thoughts or tendencies. More than half (nearly 52 percent) of our survey participants revealed that they’d had depressing thoughts while drinking alcohol. People who drink excessively may be more prone to these mental effects than those who adhere to the low-risk standards set by the National Institute on Alcohol Abuse and Alcoholism (NIAAA). What’re You Having … and Feeling? If you’re looking at the low-risk levels of consumption set by the NIAAA, you might have noticed that levels of consumption vary based on the kind of drink you’re having. A 12-ounce serving of beer may only contain 5 percent alcohol, a 5-ounce glass of table wine may contain 12 percent alcohol, and a 1.5-ounce shot of an 80-proof liquor may contain 40 percent alcohol, but they all constitute a single standard drink. Still, these amounts may not reflect actual serving sizes at bars and restaurants, so it is important to monitor consumption closely. The people we polled said that certain forms of alcohol were more likely to give them different feelings. Men told us that wine, cocktails, and India pale ales (IPAs) made them happiest when they drank, while women said that cocktails, wine, and vodka left them with the most positive emotions. However, vodka was also listed by both men and women as a drink that made them feel anxious, and men told us it made them feel sad and scared. Whiskey was also frequently associated with negative feelings. Men and women told us it made them feel overwhelmed and sad. While some men found whiskey created a feeling of nostalgia, a portion of women said drinking it made them feel scared. 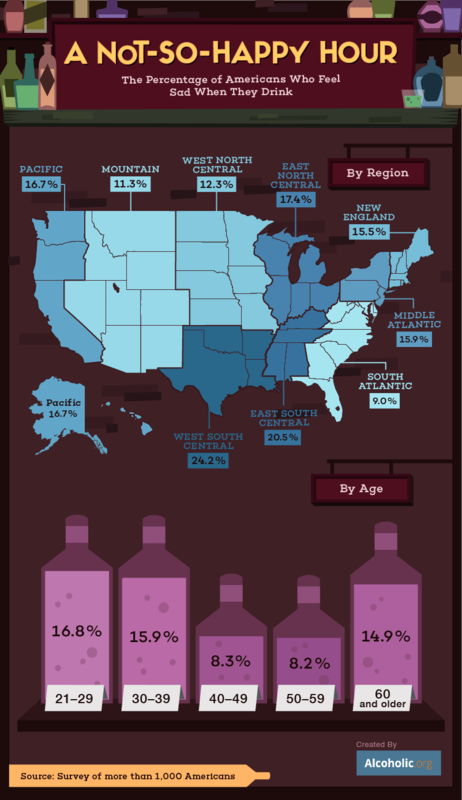 Nearly 1 in 4 people we polled from the West South Central region of the country, and roughly 1 in 5 people from both the mid and south Atlantic regions, and New England, told us that consuming alcohol made them feel overwhelmed. Alcohol consumption can impact a person's ability to process short and long-term memories, and manage and process emotions, which may create a sense of feeling overwhelmed. People between the ages of 20 and 29 were the most likely to indicate feeling overwhelmed when drinking. Elements like peer influence, genetics, and even education status can become factors in how a younger person’s body functions after alcohol consumption. Research has found that young adults in college (and living on campus) are generally more likely to engage in heavy drinking behaviors, including binge drinking. Less than 1 in 5 people between the ages of 30 and 39 told us they felt overwhelmed while drinking and slightly over 1 in 10 between the ages of 40 and 49 said the same. 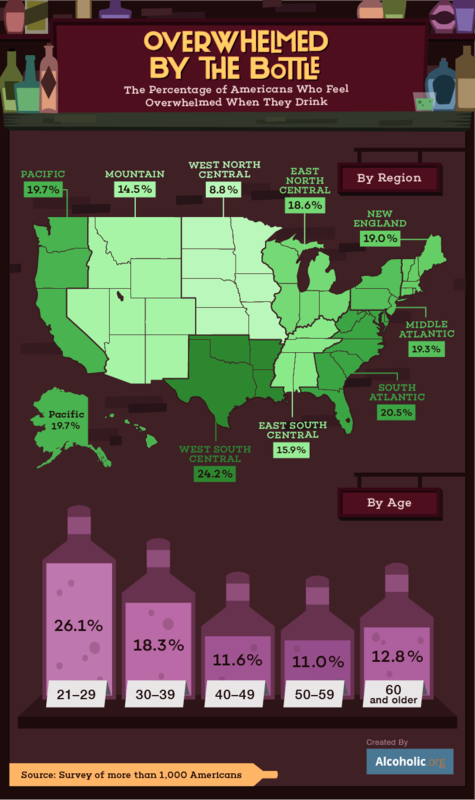 Our survey revealed that more than 1 in 4 Americans from Texas, Louisiana, Arkansas, and Oklahoma feel anxious while drinking. Experts say that feelings of anxiety stemming from alcohol consumption can last for several hours up to an entire day after drinking. Some people may use alcohol as a coping mechanism for anxiety, which can create a form of alcohol dependency that only worsens the sense of worry. Young people we polled were more likely to indicate a sense of anxiety after drinking than older people surveyed. More than a quarter of respondents between 20 and 29 years old told us they felt anxious after drinking compared to less than 20 percent between the ages of 30 and 39. While many of the people we surveyed said they felt happy when they were drinking, we found that young people between the ages of 20 and 29 were least likely to report that sense of happiness while under the influence of alcohol. As survey respondent age increased, we found that they were more likely to indicate a sense of happiness associated with drinking – 100 percent of participants 60 years or older told us that drinking made them feel happy at least occasionally. People we polled from the South and Pacific regions were the least likely to indicate feeling happy while drinking, while nearly 97 percent in the New England area and Mountain region (including states like Nevada, Arizona, and Colorado) said that drinking made them feel happy. As a social activity, drinking can lead to a temporary feeling of happiness, but those who feel joy when drinking may be at risk for alcohol dependence if they drink to continue feeling happy over time. Experts on the subject have identified alcohol as a depressant drug that can create the effect of anxiety and depression as a result of drinking too much, or drinking too fast. For those who already have clinical anxiety or depression, alcohol can worsen the symptoms of both conditions. Some people polled said they feel sad while drinking. We found those responses strongest among the youngest people we surveyed, with nearly 17 percent of young adults between the ages of 20 and 29 indicating that alcohol consumption made them feel sad. Just shy of 16 percent of respondents between the ages of 30 and 39 said the same. Many of the Americans we polled told us drinking alcohol made them feel happy. However, people we polled between the ages of 20 and 29 were the most likely to experience negative feelings like anxiety, sadness, and a sense of being overwhelmed. More than half of everyone we polled – regardless of age – told us that drinking alcohol also made them feel depressed at one point or another. 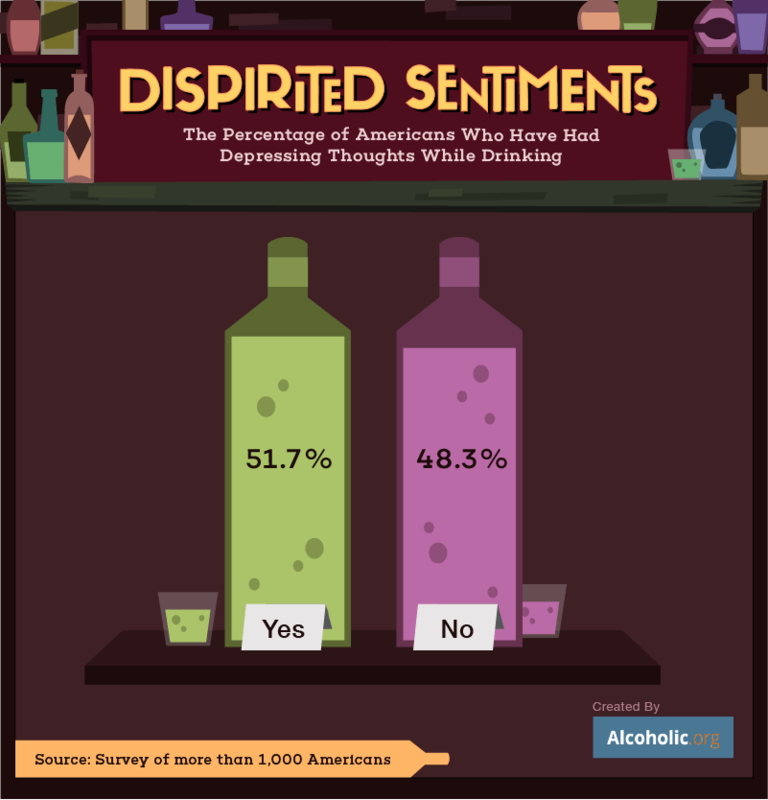 We surveyed over 1,000 people about how they feel when drinking. We asked them to associate different emotions with the consumption of a variety of alcoholic beverages, then categorized their responses by gender, age, and region.